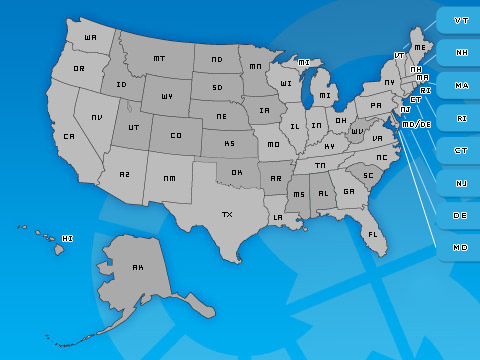 Please click on your state in the map to learn more about Stage II Decommissioning in your area. Source is reviewing Stage II decommissioning requirements across the United States. Here’s what we know. In the 1990s, The United States Clean Air Act (CAA) required many ozone nonattainment areas to adopt Stage II Vapor Recovery systems at their gasoline-dispensing facilities (GDF). Beginning in 1998, the CAA also required vehicle-makers to add onboard refueling vapor recovery (ORVR) systems for capturing gasoline vapors during refueling to all automobiles and light- and medium-duty cars, vans and trucks. Since 2006, all new vehicles and trucks have been equipped with ORVR systems. In large part because of the positive impacts ORVR systems have had on the reduction of harmful fugitive emissions during refueling, on May 16, 2012, the U.S. Environmental Protection Agency (EPA) issued a final ruling stating that since ORVR is now in widespread use, all states and regions with Stage II Vapor Recovery programs in place for ozone nonattainment areas have the option of removing these programs from their state implementation plans (SIPs). In order to approve the SIP revision, the EPA requires the state or region to produce a technical demonstration showing that removing a Stage II Vapor Recovery systems will not adversely impact air quality. GDFs that provide an acceptable technical demonstration to the EPA are allowed to permanently decommission their Stage II Vapor Recovery Systems. To aid in this process, the Petroleum Equipment Institute has created "RP300: Recommended Practices for Installation and Testing of Vapor-Recovery Systems at Vehicle-Fueling Sites," specifically Section 14: Decommissioning State II Vapor-Recovery Piping. With this new rule regarding Stage II Vapor Recovery systems recently going into effect, Source™ has been reviewing Stage II decommissioning efforts across the country. Here's what we know, state-by-state or region-by-region. 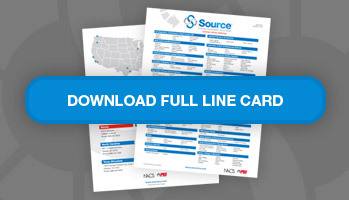 Please contact your Source sales representative for more details. House Bill 2128 exempts new gasoline stations from the mandatory installation of Stage II equipment and requires the decommissioning of all existing Stage II equipment to occur from Oct. 1, 2016 to Sept. 30, 2018. The Arizona Department of Weights & Measures has developed rules, effective Oct. 6, 2015, for the decommissioning process. The department has also established requirements for remaining Stage I vapor recovery systems. The Arizona Department of Weights & Measures will host conference calls at 1 p.m. Sept. 29, 2015, 10 a.m. Oct. 8 and 3 p.m. Oct. 20 to review decommissioning requirements. Alternate Decommissioning Plans are due Dec. 31, 2015. California has not waived any Stage II Vapor Recovery requirements and the California Environmental Protection Agency still requires the operation of Stage II systems throughout the state. This rule is expected to remain in effect until 2030. 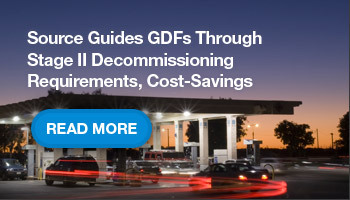 Effective Sept. 11, 2015, new GDFs or GDFs being modified with monthly throughput greater than 10,000 gallons of gasoline are no longer required to install Stage II vapor recovery equipment. These GDFS will be required to install and use CARB-certified enhanced Stage I vapor control equipment to control emissions when underground storage tanks are being filled. These GDFs also are required to either comply with testing and monitoring procedures, or participate in a trial demonstration of CARB-certified CPM systems for its storage tanks. As of May 15, 2007, Florida no longer required Stage II Vapor Recovery installation in Palm Beach, Broward and Miami-Dade counties. Stage II decommissioning started on 5-1-2014 must be completed by 4-30-2016. The Illinois Pollution Control Board adopted decommissioning rules on December 19, 2013. Effective as of January 1, 2014 Illinois is now accepting “Notice of Intent” forms, which must be submitted prior to starting any work. Stage II Decommissioning forms and related information can be found on the State of Illinois EPA website http://www.epa.state.il.us/. Illinois will require all decommissioning to be completed by Dec 31, 2016. As of April 12, 2013, new stations, and those that meet certain upgrade/update requirements, are no longer required to install or maintain vapor recovery systems. The Indiana Department of Environmental Management must be notified before decommissioning an existing site. This department can be contacted at Stage2notify@idem.in.gov or at (317) 233-6865. Motor fuels retailers in Boone, Campbell, Jefferson and Kenton counties are no longer required to install Stage II Vapor Recovery Systems for new installations. Likewise, existing Stage II Vapor Recovery Systems are no longer required and must be decommissioned by December 31, 2018. Stage II Vapor Recovery is still required in the six parishes surrounding Baton Rouge. The rule does not apply to segregated E85 dispensing systems that can only dispense to E85 vehicles. Please note that in 2012 the state issued a potpourri memorandum which suspended Stage II requirements for new construction and significant upgrades, but cautions that if at any time the department deems the vapor recovery systems necessary, the stations will have to retroactively install and/or connect said systems. Maine’s Department of Environmental Protection amended its air rules in April 2011 and repealed its Stage II Vapor Recovery requirements as of Jan. 1, 2012. GDFs with Stage II systems must have discontinued the Stage II systems and/or removed the Stage II systems by Jan. 1, 2013. Stage II decommissioning started as of 3-6-2014 but no completion timeframe to date. Stage II decommissioning started 7/9/12, per MassDEP’s first Stage II enforcement discretion letter. Effective January 2, 2015, amendments to MassDEP Air Pollution Control Regulations at 310 CMR 7.00 and 310 CMR 7.24 require the removal of Stage II vapor recovery systems and enhancements to Stage I vapor recovery equipment at gasoline dispensing facilities (GDFs) across Massachusetts, and the completion date is 2 years from this effective date. In April 2011, the state waived its Stage II Vapor Recovery installation requirements. The Department of Natural Resources’ Air Pollution Control Program announced that effective March 15, 2013, gasoline stations in the city of St. Louis and Jefferson, St. Charles, Franklin and St. Louis counties are subject to Stage II Vapor Recovery Rules and may begin to decommission their Stage II Vapor Recovery Equipment, following proper procedures. According to the department’s Code of State Regulations 10 CSR 10-5.220, Stage II Vapor Recovery systems must be decommissioned by Dec. 31, 2015. Stage II Vapor Recovery is required in Las Vegas and Reno counties, which are autonomous from the state's air program. Has not waived Stage II Vapor Recovery requirements and a GDF can only be in operation if it is equipped with a vapor-control system. Dona Ana County (Las Cruces, NM/El Paso, TX, area) is the only county that requires Stage II Vapor Recovery. Stage II decommissioning is allowed when proper removal procedures are followed. The state repealed its Stage II Vapor Recovery requirements, which applied only to Mecklenburg County (Charlotte), on April 19, 2009. The Ohio Environmental Protection Agency has allowed decommissioning of Stage II vapor control systems since January 17, 2014. Ohio requires statewide decommissioning of Stage II vapor recovery to be completed by January 1, 2017. In addition as of April 1, 2014 the state also requires installation of low permeation hose. Has not waived Stage II Vapor Recovery rules, which require vapor-control systems in the Portland-area counties of Multnomah, Clackamas and Washington. The Pennsylvania Department of Environmental Protection (DEP) announced that effective November 12, 2016, it will no longer enforce the Stage II vapor recovery requirement for new or modified gasoline dispensing equipment. 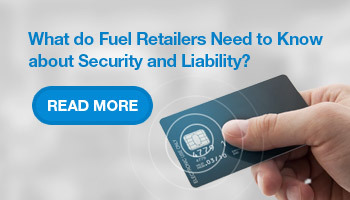 For owners and operators of gasoline dispensing facilities with Stage II vapor control systems in place to meet the Stage II requirements, the Department will continue to require operation and maintenance of those systems in accordance with 25 Pa. Code § 129.82. This suspension only pertains to new gasoline dispensers and dispensers replacements. Stage II decommissioning started 12-25-2013 and must be complete by 12-22-2017. Also by December 25, 2020, all GDFs must have installed a CARB-certified EVR Stage I system or a Stage I system made up of EVR components. Gasoline dispensing facilities with existing Stage II vapor recovery systems would have to decommission and remove their Stage II systems no later than January 1, 2019. On and after January 1, 2016, no gasoline dispensing facility would have to install a Stage II system. Stage II systems must be removed according to PEI’s Recommended Practices for Installation and Testing of Vapor-Recovery Systems at Vehicle-Fueling Sites (PEI/PRP300-09). In a related rulemaking proposal, Tennessee proposes to lower the applicability thresholds for certain gasoline storage tanks subject to federal Stage I requirements. Tennessee’s revised state requirements would be as stringent as or more stringent than the comparable federal requirements. Effective May 16, 2014, Gasoline Dispensing Facilities with Stage II equipment may now elect to remove their Stage II systems. Owners (or their Licensed A/B Tank Contractor) must file 30 day Notification with the appropriate TCEQ regional office and/or the local government program having jurisdiction. A link to the form is provided in this Regulatory Alert. Contact and address information is provided on the 2nd page of the form for the regional TCEQ and local government offices. In addition, follow-up confirmation to the appropriate regional/local government office 24 – 72 hours prior to the scheduled date is required. Stage II decommissioning must be completed by 8-31-2018. In 2009, Vermont’s Agency of Natural Resources enacted a law that authorized the phaseout of Stage II Vapor Recovery systems. Effective January 1, 2013, GDFs can discontinue the use of their Stage II systems, and all systems must be properly decommissioned by Jan. 15, 2015. Decommissioning is currently allowed when certain requirements are met. New locations do not require Stage II. Has not waived Stage II Vapor Recovery requirements for a total of seven counties in the Seattle and Vancouver areas. Has not waived Stage II Vapor Recovery System requirements. The governor signed a law that now allows decommissioning of existing sites in Wisconsin affecting the counties of Kenosha, Kewaunee, Manitowoc, Milwaukee, Ozaukee, Racine, Sheboygan, Washington and Waukesha. Please refer to the specific statute 285.31 for details here. Additionally, according to the WI DNR website, site owners can apply for state grants to fund decommissioning projects. The deadline to apply for a grant is May 15, 2015.